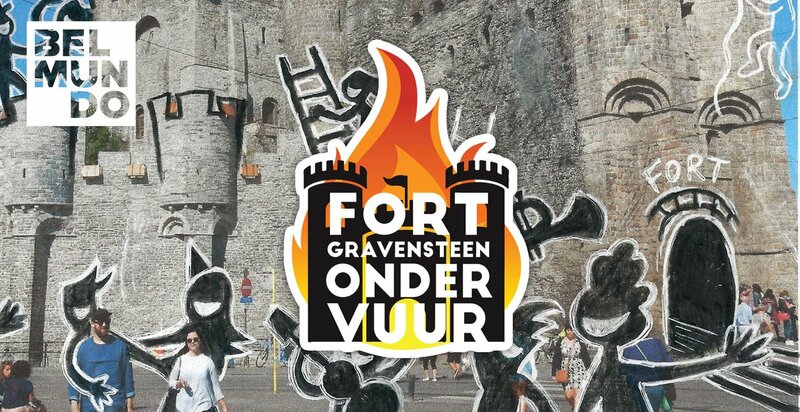 Historic Gravensteen Castle (Ghent, Flanders) was selected by a coalition of left-wing groups last weekend to represent ”Fortress Europe” in a migrant solidarity event billed as the symbolic storming of an EU closed to migrants. ‘’He’s sabotaging the action!’’, a leftist organizer cries out from the upper walls of the castle as Schild en Vrienden leader, the photogenic Dries Van Langenhove, dramatically climbs over a crenellated rampart to cut down a vertical banner promoting the storming of the fortress, the fortress in this case being a metaphor for a Europe supposedly closed to migrants. In spite of NGO claims, official statistics show that a staggering 5 million migrants arrived to claim asylum in the EU between 2011 and 2017, with almost 3 million asylum applications being made in 2015 and 2016 alone. Weekend visitors to the touristic attraction soon began to notice the commotion taking place as tensions rose and the central prop of the event, a gigantic EU flag bearing the phrase ‘’Europe can be different’’ was cut down from its prominent position, left hanging neither up nor down until a handful of nationalists at ground level tore it away from the castle walls. Angry shrieking and gasps of incredulity can be heard from supporters of the open borders event as the flag is torn down. Cheers erupt simultaneously. At various intervals during the day, left-wing organizations – including a theatrical troupe – had led small children in mock attacks on the castle, storming through its gatehouse in a politically themed spectacle featuring people smugglers and stern border enforcers. Informational stalls calling for politicians to ensure safe migrant routes into Europe also featured as part of the event. ‘’Flemish youth will not allow their cultural landscape to be abused for leftist open borders propaganda’’, Van Langenhove confidently asserts whilst surrounded by supporters in a slick video released by the group following Saturday’s action. ‘’We want to change the mindset of the Flemish youth. We want them to stand up and be proud of who they are’’, he explained to The Gateway Pundit, adding that since founding last August, his organization has attracted almost one thousand members. A rallying cry he sees striking a chord with countrymen in more modern times, regardless of ”state subsidized propaganda” for open borders. De actie van Schild & Vrienden in het VTM NIEUWS. Wij laten ons Vlaams cultureel erfgoed niet misbruiken voor de open grenzen agenda van linkse subsidieclubjes. De Vlaamse jeugd komt op voor haar toekomst! The post VIDEO: Flemish Patriots Tear Down Massive EU Flag From Historic Castle At Open Borders Event. Shocked Leftists React In Horror appeared first on The Gateway Pundit.